This is probably the first map of the London area showing how fields were used for different crops. This shows how they were used in 1800. In other years it would have varied slightly. But most fields in Stoke Newington would have stayed as meadows for many years because Stoke Newington lived by producing milk for London. Each field is coloured according to the table below to show how it was used in the year of the survey. The following year it might be used for another crop and changed back again later. Meadows might be used unchanged for years. This map is a typical snapshot of the period. 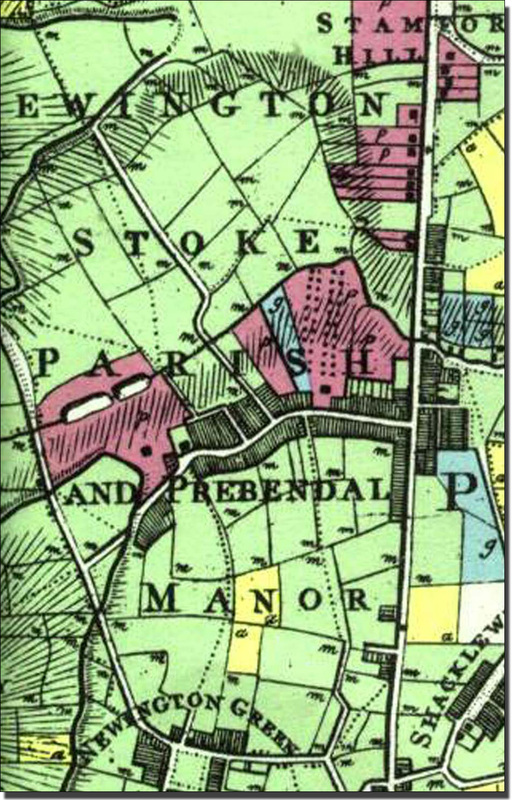 Stoke Newington people live in these fields today and you may be able to find your own one. At this period the land had not been fully enclosed: some fields were still held in common by people who lived in the village, as in feudal times. Villagers had had the right to graze their geese, cow or horse on the common. By 1800, many fields had been enclosed. Newington Common had been enclosed and shared out among the Commoners (the villagers who shared the common). Some common meadows, arable fields and marsh are still left, but even the enclosing of the marshes has begun. The map has been beautifully reproduced in colour by the London Topogrphical Society. It costs only £15, covers an area of about 42" x 42" in six sheets, and has an erudite accompanying text, itself worthy of display. Covered with a plastic and framed, it would enhance any school corridor or foyer.